When singer-actor Zheng Yunlong was asked what his reaction would be if he woke up to find that he suddenly possessed a couple of oversized ears like Dumbo, the 28-year-old says he would take selfies and post the photos on his WeChat account. 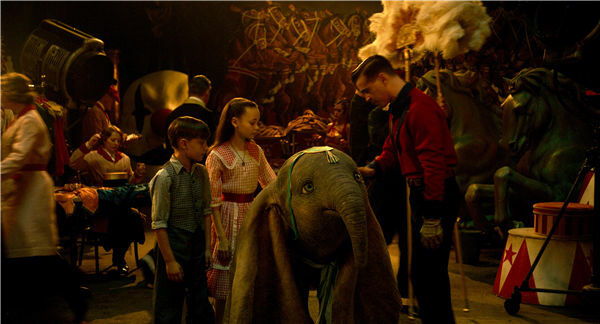 His answer is interesting since it quickly establishes a connection between Chinese youngsters and the character of Dumbo, the titular baby elephant in Disney's 1941 classic animated film. Zheng, who was recruited to sing the Chinese version of the theme song in the upcoming remake of Dumbo, performed the song at a premiere screening at the Walt Disney Grand Theatre at the Shanghai Disney Resort on Tuesday night. "It's a very heartwarming and inspirational story, and Dumbo is so cute," says Zheng. The new live-action adaptation, also titled Dumbo, will open across Chinese mainland theaters on March 29. The award-winning actor, who is also known for popular variety shows such as Super Vocal and Singer, reveals he used some musical techniques in his rendition borrowed from the iconic song Baby Mine, which was nominated for an Academy Award for best original song in 1942.